Christopher Saint-Remy has faced his fair share of adversity and then some at just 28 years old. He was born without a fully formed right leg and has worn a prosthetic his entire life. Saint-Remy also suffers from prune-belly syndrome, a rare disorder characterized by the partial or complete absence of abdominal muscles. On top of all of that, his mother and main caregiver, Gina Saint-Remy Cyriaque, passed away from colon cancer in 2009. Despite all of the obstacles he’s faced, Saint-Remy has remained positive and confident thanks to one thing: basketball. Born in Haiti, Saint-Remy came to the United States when he was approximately 8 years old to get the proper care and treatment for his prune-belly. He had a 16-hour operation in North Carolina that reduced the size of his bladder and reorganized his organs; the procedures were needed due to his lack of abdominal muscles. The doctors were worried Saint-Remy wouldn’t survive the operation. After rehabilitation, which included learning to walk again, Saint-Remy relocated to New York. There he began playing basketball, specifically able-bodied basketball, when he was about 10 years old. After playing able-bodied basketball growing up, it wasn’t until his junior year at Sewanhaka High School in Floral Park, N.Y., when Saint-Remy transitioned to wheelchair basketball. Wheelchair basketball gave Saint-Remy the opportunity to attend college; he received a scholarship to play at the University of Arizona, but he returned home when his mother passed away. Saint-Remy continues to actively play wheelchair basketball. 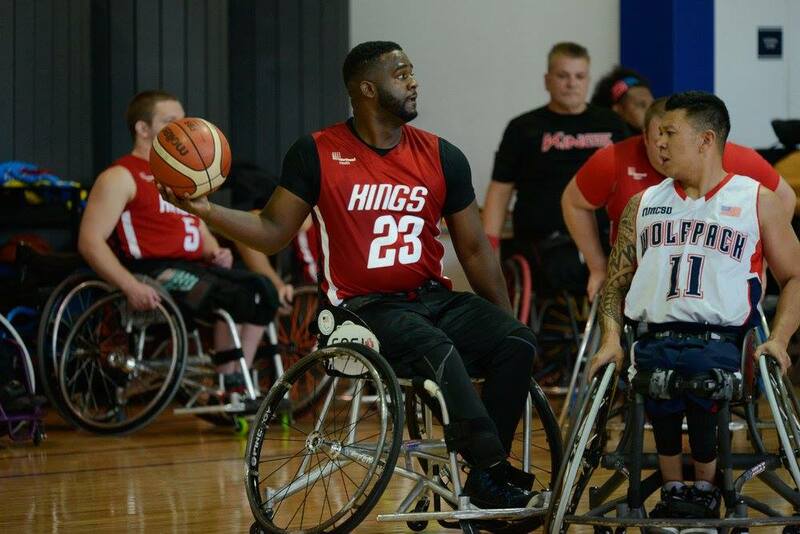 He’s currently on the Nassau Kings, a New York-based wheelchair basketball team that plays in the National Wheelchair Basketball Association (NWBA) Division II. The Kings recently won the 2017 Matthew Sapolin Memorial Wheelchair Basketball Tournament in Brooklyn, defeating the San Diego Wolfpack 53-51 in the Division II final. Saint-Remy was named division MVP. Wheelchair basketball utilizes a classification system, ranking each player from 1 to 4.5 points based on his or her functionality, with 1.0 indicating the least functional ability and 4.5 the most. Saint-Remy is characterized as a 4.0. NWBA teams are allowed to field a maximum of 15 combined points at any given time on the court. While he plans to play wheelchair basketball for as long as he can, Saint-Remy’s No. 1 goal is to represent the United States at the international level. The only issue is he isn’t an American citizen, but he’s working on obtaining his green card in order to help turn his dream into a reality. Saint-Remy also wants to help motivate and inspire others who going through similar situations. Every morning Saint-Remy thanks God for life, his family, his friends, his girlfriend, and of course, basketball—what he refers to as his starting five. Cameron Wiebe, golf pro and general manager at Champions Retreat in Evans, Ga., shares his top tips and advice for novice and casual golfers. Not only do players get to test their virtual drone skills, but the top 24 global competitors (18 years old or older) will earn a chance to showcase their skills at the live esports-style 2018 Swatch DRL Tryouts on February 3, 2018. The winner of that competition will be rewarded with a $75,000 contract as the latest DRL pilot.